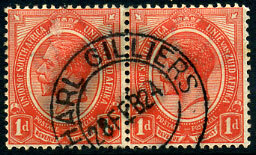 23 JUL 15 on vertical pair SA KGV 1d. 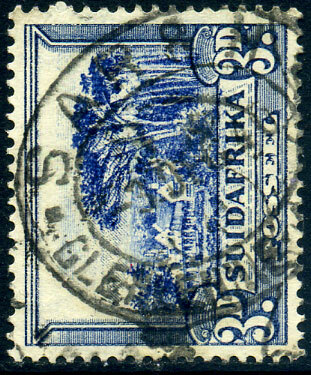 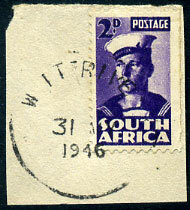 22 JAN 42 on SA 1½d piece. 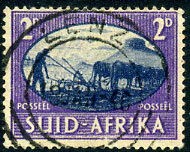 Putzel unlisted dated 3 OCT 40 on SA 3d. 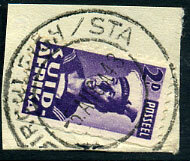 purple parcel canceller on pair South Africa 4d piece. 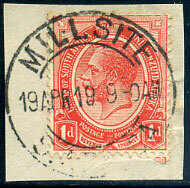 30 JUN 1914 on South Africa KGV 1d piece. 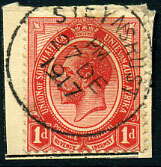 dated 13 MAY 19 on South Africa KGV 1d piece. 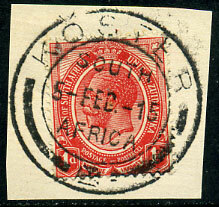 Railway Office dated 17 JUL 1920 on South Africa KGV 1/-. 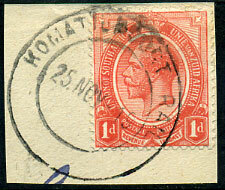 23 OCT 13 on horiz. 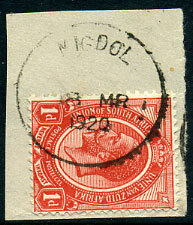 pair South Africa KGV 1d. 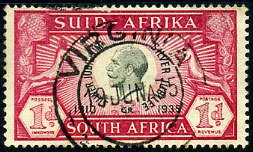 12 JAN 15 on vertical pair South Africa KGV 1d piece. 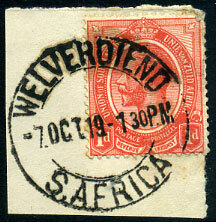 7 OCT 19 on South Africa KGV 1d piece. 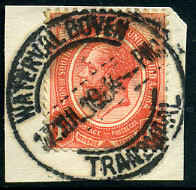 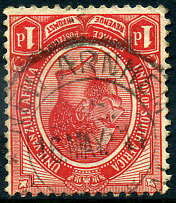 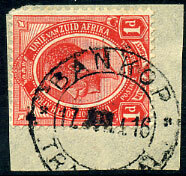 17 JUL 1914 on South Africa KGV 1d piece. 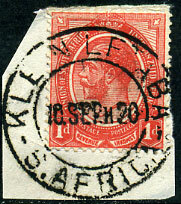 19 SEP 14 on South Africa KGV 1d piece. 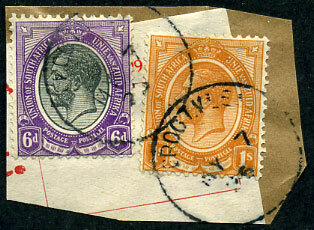 newly discovered dated 16 MAY 1914 on South Africa KGV 1d. 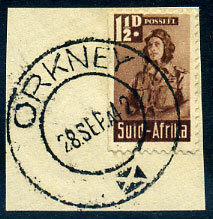 25 NOV 19 on South Africa KGV 1d piece. 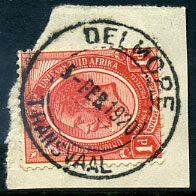 5 FEB 15 on South Africa KGV 1d piece. 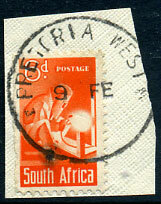 10 SEP 20 on South Africa KGV 1d piece. 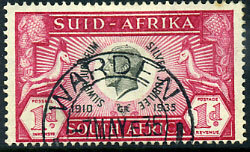 9 AUG 15 on South Africa KGV 1d. 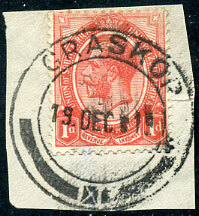 19 JAN 23 on horiz. 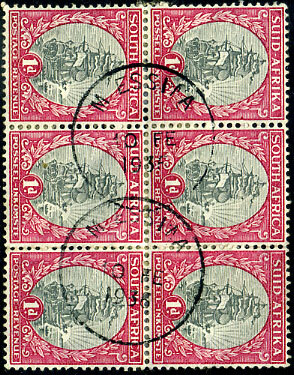 pair South Africa KGV 1d. 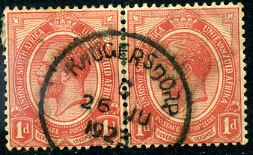 10 AUG 21 on vertical pair South Africa KGV 1d piece. 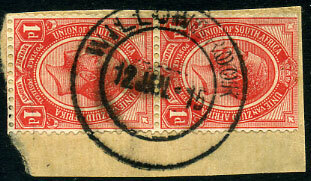 MY 7 25 on South Africa KGV 6d, 1/- piece. 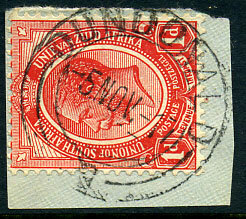 19 DEC 19 on South Africa KGV 1d piece. 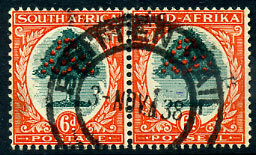 17 FEB 20 on pair South Africa KGV 1d piece. 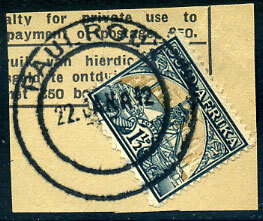 17 MAR 20 on South Africa KGV 1d piece. 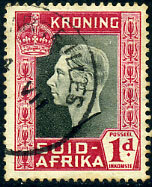 5 FEB 1920 on South Africa KGV 1d piece. 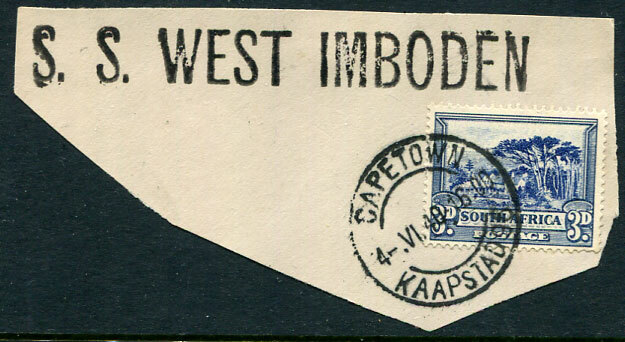 Newly discovered short-lived 1st office cancel dated 5 NOV 17 on South Africa KGV 1d piece. 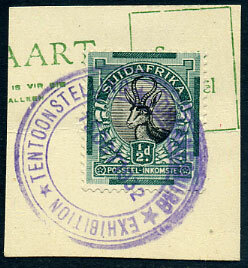 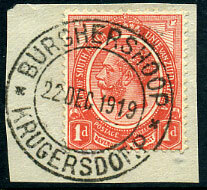 22 DEC 1919 on South Africa KGV 1d piece. 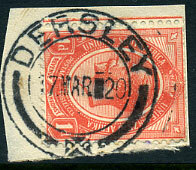 25 MAR 1924 on horiz. 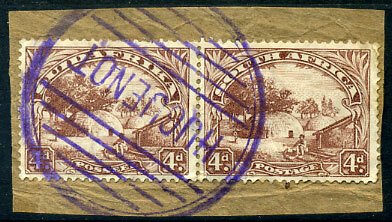 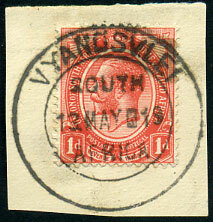 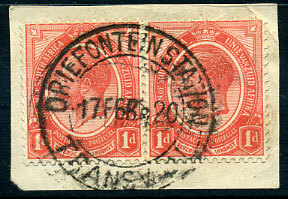 strip of three South Africa KGV 1d fragment. 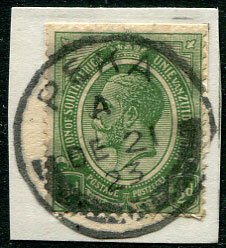 28 FEB 24 on horiz. 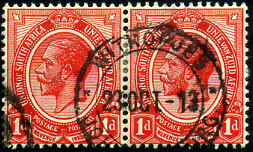 pair South Africa KGV 1d. 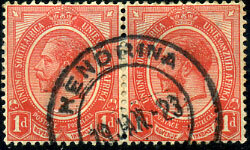 3 NOV 38 on horiz. 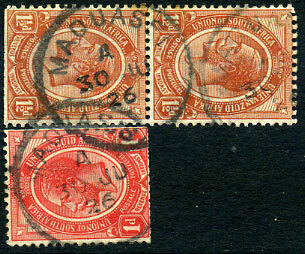 pair South Africa 6d.